Ours is a name that comes to the mind first whenever the demand for well-processed Saffron hovers over the market. We are referred to as the chief Manufacturer, Exporter, and Supplier of Saffron from Mashhad, Iran. We observe good practices all along, which ensures that what we come up with is 100% compliant products. Saffron is skillfully dried stigmas of crocus sativus flowers, a small perennial plant about a foot tall. Each flower has three female parts (stigmas) and two male parts (stamen). Each stigma is threadlike in appearance and is red or dark red in color towards the top and yellow towards the bottom of the stigma, where it is attached to the flower. Saffron has a bitter flavor and a strong, sharp, penetrating scent. The flavor, aroma, and coloring capability come from the red part of the stigma. The yellow part has no value as a spice. Negin Poushal Saffron : This type of saffron from the viewpoint of ratio of style is similar to ordinary Poushal saffron, but this type of saffron having varieties that is longer and thicker than ordinary saffron. The color power is about 250 USP or higher and is extraordinary from the viewpoint of mass and beauty. Sargol Saffron : This type of saffron is completely pure and is with the cutted tissue of saffron without style. Color power of this type of saffron is very high (in Iranian saffron above 250 USP) and there is no breakage among the tissues. 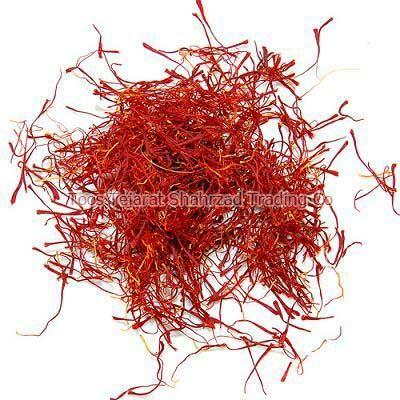 Poushal Saffron : This type of saffron includes tissue. Together with 2-3 mm style, color power of this type of saffron is about 220 USP. Bunch Saffron : This type of saffron includes all tissues or filaments of saffron and depends upon its varieties, condition of harvesting and cultivating for example soil, the red section can be higher than the yellow section.